Prevent Breast Cancer funds world-leading research into mammographic density, known more commonly as breast density. Breast density is one of the biggest risk factors for developing breast cancer. If a woman has a high level of breast density, they are unfortunately up to six times more likely to get breast cancer. Our charity’s researchers aim to find out why some women have denser breast tissue (which appears whiter on a mammogram) and why denser breasts are more likely to develop cancer. 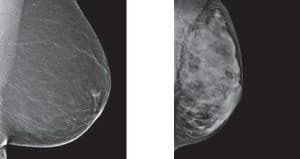 The picture below on the left is an example of of a mammogram with very fatty breast tissue, whereas the one on the right shows very dense breast tissue. Prevent Breast Cancer’s latest four-year study into breast density aims to find out why a woman with denser breasts is more likely to develop gene mutations in their DNA which cause breast cancer. This builds on previous research showing that breast cells grown in a very stiff environment are more likely to show these genetic mutations. To answer this question, a team of researchers, led by Dr Andrew Gilmore, will create a cell model to mimic levels of high- and low- mammographic density in order to find out how exactly tissue stiffness leads to new, cancer-causing DNA mutations. Next, the researchers will look for these changes in human breast cells, collected from women undergoing preventative breast surgeries. This will allow our researchers to help determine the changes which may have played a part in the increased risk seen in high breast density women. If you would like more information about this project, please click here or download the project information sheet to the right of this page. To donate to projects such as this one, please click here and pick Gene Research from the list of drop down options.